and Other Helps for Writers! 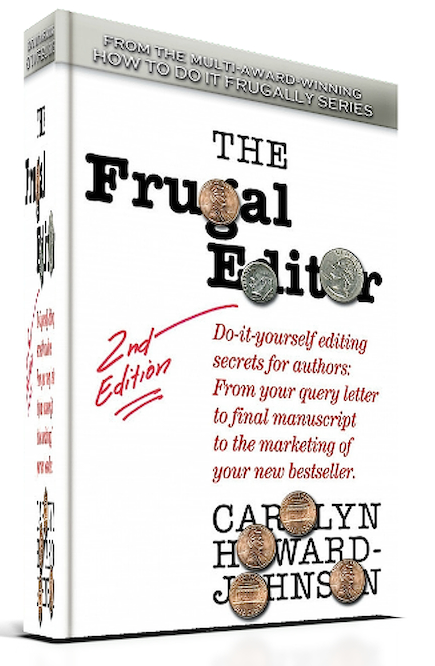 Carolyn's newest in the How To Do It Frugally Series of books for writers is multi award-winning The Frugal Editor designed to help authors hire better editors, better partner with their editors and self-edit when necessary. The marketing plan for this book also won the Next Generation award. 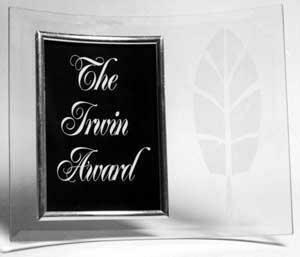 The promotion campaign for The Frugal Editor won the Millennium Award for Marketing. can help writers on my Sharing with Writers blog. Trafford offers excellent materials to help you decide if they are the ones to publish your book. They do quality POD publishing. Gorham Printing has a free e-book with some neat guidelines on publishing on their home page. Check it (and their services) out. Ger your Great Little Last-Minute Editing Tips as an e-book with your subscription to my SharingwithWriters newsletter. Click here for Carolyn's first person essay, "Beating Time at Its Own Game." 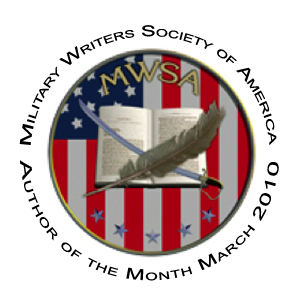 Sharing with Writers and Readers blog. I love making lists. You'll find many books not listed here in the indexes of my books. I just figure books are one of the most frugal ways for us authors to learn what we need to know. And we're supporting our own industry by buying them! You'll also love the lists of my favorite books that help writers in the indexes of my multi award-winning HowToDoItFrugally Series of books for writers. So, you're on the right track! Find what you need for your writing and promotion efforts here! "Over 80% of people plan to write a book and more than six million of them have already written a manuscript. Admittedly there are dozens of companies who will take your money and publish your book. How do you get a book publisher to pay you for your book? "Former book acquisitions editor Terry Whalin says editors and publishers don't read manuscripts. They read book proposals. 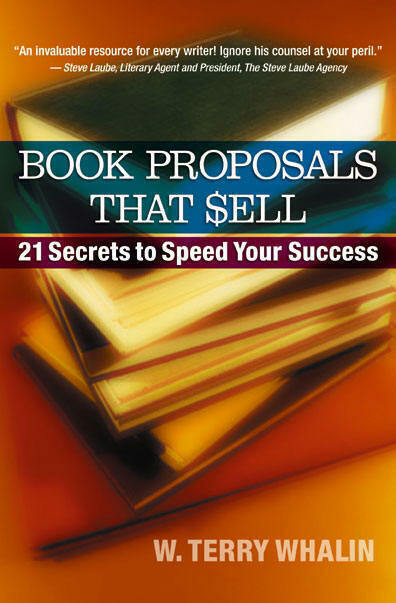 In BOOK PROPOSALS THAT SELL, 21 SECRETS TO SPEED YOUR SUCCESS, you learn the inside scoop to achieve your dreams." by Valerie Allen: People do business with people they know - which is why you must tell to sell. This book is your step-by-step guide for name recognition, networking, and creative marketing to increase book sales. With little or no promotional budget, you can do these painless activities for successful marketing and book sales. Get Published Today! is a must-read if you have ever considered going it on your own. By marketing expert Penny Sansevieri. If you aren’t a Webby nerd but would like to polish your online publicity efforts may I recommend Penny Sansevieri’s Red Hot Internet Publicity. She starts basic and stays practical. It isn’t specifically written for authors, which—in this case—may be a good thing. Terry Whalin and I often appear at writers' conferences together and I've read his books and recommend them. But I'd never attended one of his presentations because they conflicted with my own. At the last one we were at, Terry said he had repurposed one of his seminars to an audio CD and graciously presented me with one. I just listened to it as I drove the California freeways. It is Jumpstart Your Publishing Dreams and I love, love, love it! Terry comes at helping other authors through experience and he loads his talks with anecdotes that make his advice entertaining, understandable and memorable. Even though this is recorded live at a seminar, the recording is clear and professional. All I can say is "Wow!" I could tell you all the points he covers, but I won't. You might be tempted to think you know that stuff. But this audio is so much more than the sum of its parts. If your publishing career is lagging or if you'd like to change that path you've been taking (or if you just need a review and a big shot in the arm of energy and ideas! ), this is an audio workshop worth the money—even for frugal me. 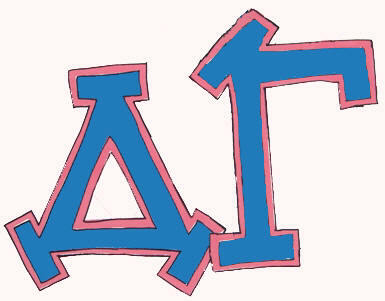 Find it at: http://bit.ly/RxJcfa. Think of it this way. The CD is maybe 1/8 the cost of a real live conference. And you can play it any old time you have the time. 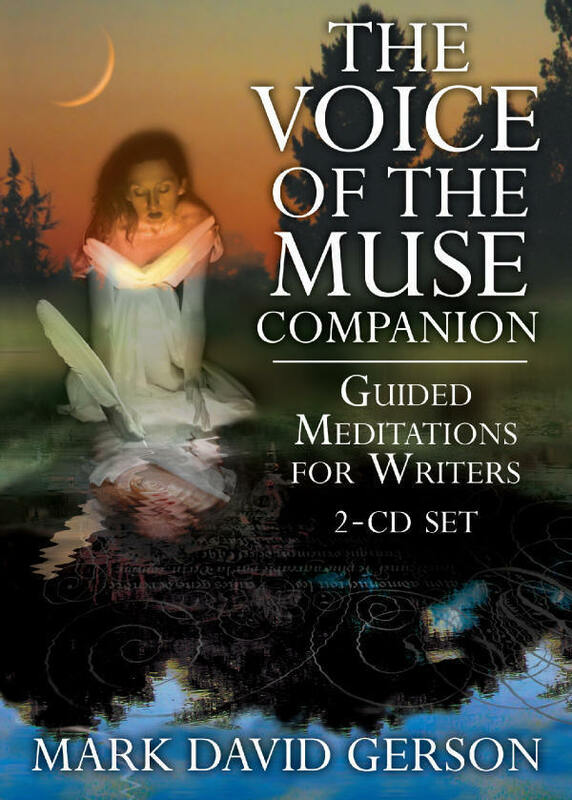 The Voice of the Muse: Answering the Call to Write (ISBN: 978-0-9795475-5-3) by Mark David Gerson. Tools, Tips and Inspiration to Unleash the Power of Your Creative Potential. "Building a character from the ground up is simple. Building a memorable, living, breathing human being is a most daunting and complicated task, until now. 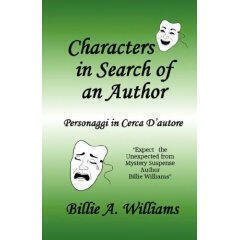 ...Billie A Williams...[gives] character-building tips, tricks, and tools you can master in one afternoon." ~ Beth Erickson, editor, publisher and freelance copywriter. 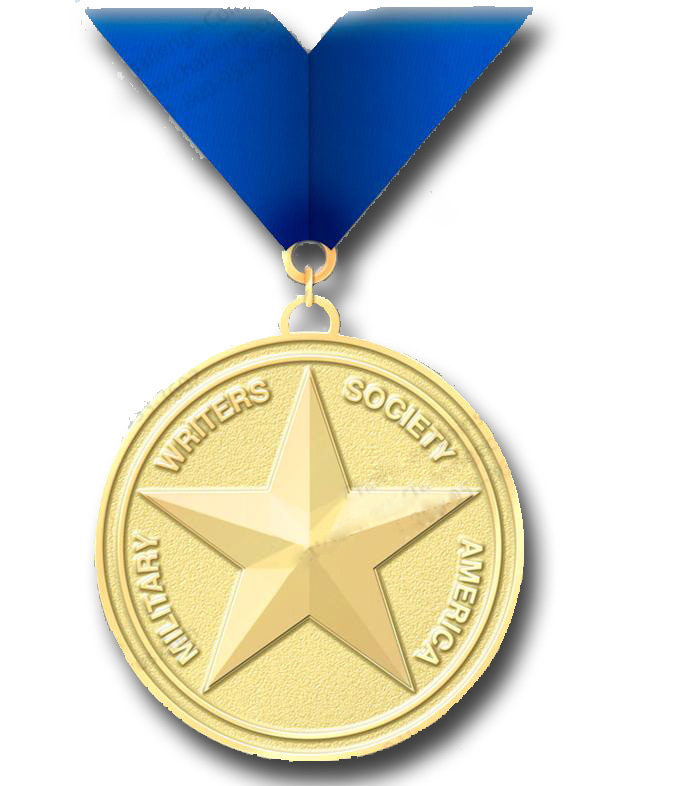 Kristi Holl's Writer's First Aid, gives writers help and encouragement. She is the author of 35 books and experience counts. Offer something free to your loyal followers. That could be a free e-book or a free article. I once gave a free e-copy of the first in my Celebration Series of Poetry to my newsletter subscribers. Why Your Writing Isn't Working and How to Fix It ISBN 0-9656309-8-6 Audio Book. This single CD packs into one hour what you might get from a week-long writing workshop. It has been distilled from classes, seminars and workshops given from Florida to Finland and holds the accumulated wisdom of 25 years of writing, editing and publishing savvy. It will open your eyes and save you time. June Casagrande's Grammar Snobs Are Great Big Meanies (Penguin) is not only full of good stuff that will make a better editor of you, it's fun. It is a great companion to The Frugal Editor: Put Your Best Book Forward to Avoid Humiliation and Ensure Success. Find Meanies at Amazon. PS: My award-winning novel This Is the Place and my book of creative nonfiction stories,Harkening, are examples of how your genealogy and your diaries might turn into different kinds of books. Find them both in Amazon's new and used feature, probably for the frugal price of under $1 . The Slippery Art of Book Reviewing by Mayra Calvani will teach you everything you’ll ever need to know about reviewing, from how to write them to understanding their influence over the wider spectrum of the publishing world. Check out Peter Bowerman's Well-Fed Writer books. Michelle Dunn's e-book report on a book marketing success system is excellent. Writing for Profit: Break into Magazines by Cheryl Wright. Click here to order this e-book. In this bleak economy, there is still one avenue that's free - being a guest on radio. Talk Radio Wants You - An Intimate Guide to 700 Shows and How to Get Invited (McFarland & Co 2009) provides all you need to know about each show before contacting a host - the theme, guest criteria, the host's opinion of the best and worst guests and what determines who gets invited back. Use Listmanias on Amazon to get better exposure for your book. Just make a list of great books in the same category as yours and add yours to it! That list may eventually appear on the buying page of every single one of the books you list! More than 46,000 people have clicked on my lists. Can't sniff at that kind of targeted marketing, now can we! 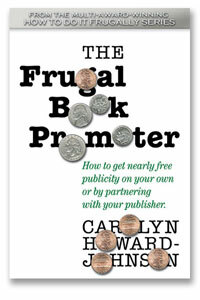 PS: You'll find more details of how to build a list in The Frugal Book Promoter. Find at least one tip on writing, promotion, or tech, on every page of this Web site. 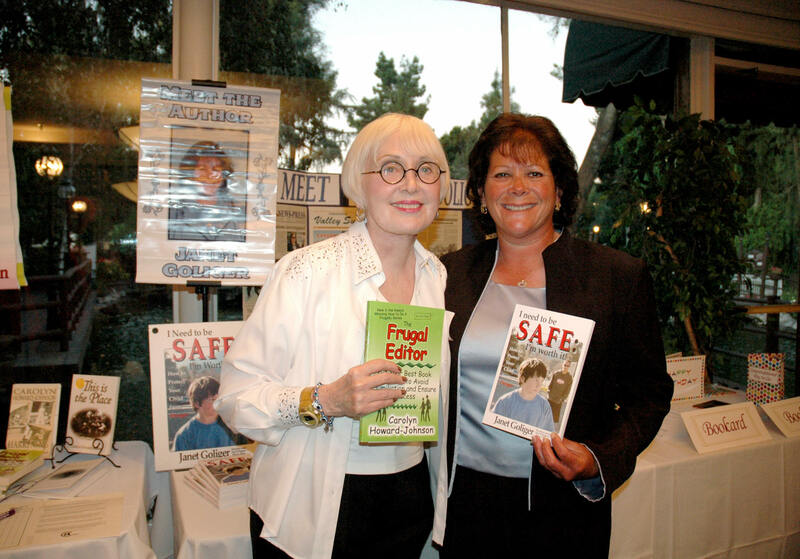 The Frugal Book Promoter is one of your most valuable resources because it is written from personal experience and gives you the basics for promoting everything else you do--in print, on TV or radio, or online. See an excerpt on Fifteen Publicity Commandments, and excerpt from that book. can utilize.Your book is now a fixture on my desk. Your book on frugal publicity is a 'classic.' I have it, I've read it, I've recommended it, I believe in it, & I've met you... and I can easily talk about it. 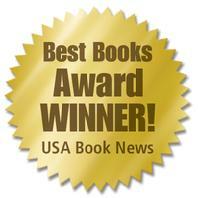 Click Here for a list of book fairs, tradeshows, conferences and conventions. Your aid to planning ahead. You will find at least one promotion, writing. or tech tip on every page of this site. Sometimes you'll find, two or three! Happy browsing and collecting! Carolyn's favorite resource for writers is the one that lists media (or press) release disseminators--complete with mini reviews. Can you find it? ABWA is a group of highly skilled networkering women in business. This unique book paints a revealing picture of America for those foreigners who will benefit from a better understanding of America. 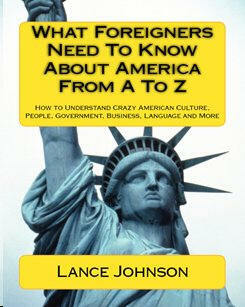 Endorsed by ambassadors, teachers and editors, it even examines our culture, customs and language. Carolyn loves the chapter that simplifies English grammar and one on accent reduction.